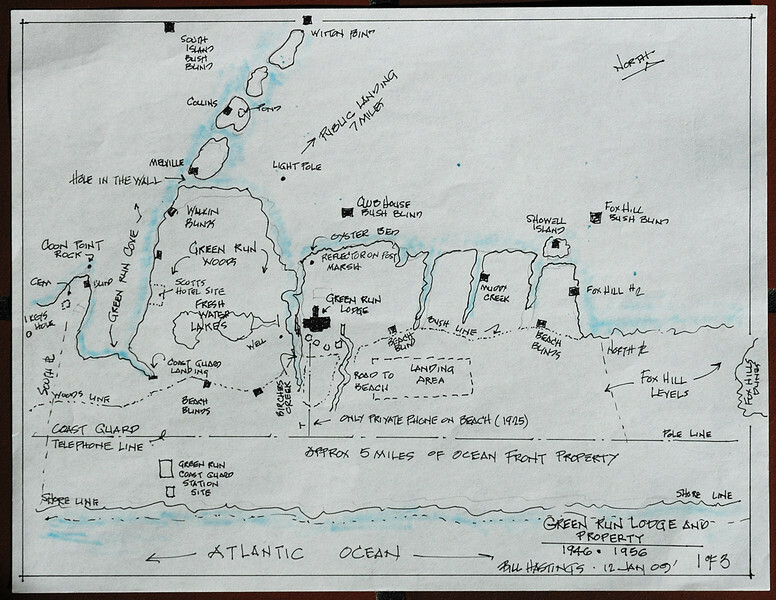 All drawings courtesy Mr. Bill Hastings, who spent his "formative" years helping his uncle Mr. Bob Jackson at the lodge. There are very few people alive who could make this drawing and the two others....many thanks Bill. The property was several thousand acres, with five miles of beachfront. While the details of the transaction are unclear to me, Leon Ackerman eventually purchased all the beach front and almost all of the bay side. ...Note though Bob Jackson retained ownership of the land where the current "Green Run" is located. After the deal was done Ackerman burned down the buildings at the original Green Run. Two buildings were moved to the new location though, one being the cook shack from the 1875 Life Saving Station at Green Run.